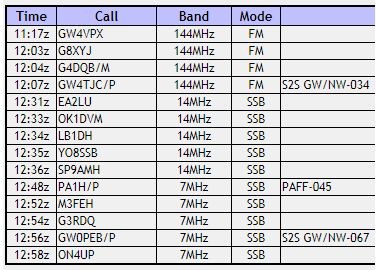 M0PLA/P SOTA Activations: 29th July 2017. GW/MW-004 SOTA Activation visit. 29th July 2017. GW/MW-004 SOTA Activation visit. Grid SN 798771, Altitude 610M. Another new summit for us today was Pen Y Garn, this summit is about 3 1/2 miles to the East of Devils Bridge Falls. We had a few problems before we left home (family problems) and managed to leave at 08:40 a.m. and arrived at 10:45 a.m. the journey from Telford was straight forward. After looking at M0JCQ's (James) blog I decided on parking at Grid SN 80091 77685. As James said this only leaves a 15 minute walk to the trig point. I have never before been so close to any large wind turbines and didn't realise the gigantic size and noise they actually made. We arrived at the summit and I quickly set up the new 2 M Yagi I had built a week ago and Jamie had already started to cook. Our usual SOTA Sandwich Bacon and Black Pudding roll with brown sauce. (it goes down very nicely before operation starts). During eating I decided to quickly test the Yagi before I set up my mast, I had a very quick reply from GW4VPX (Allan) and said every thing sounded ok.
Once I had set up the mast with my end fed (20M & 40M) and everything tested ok on the SWR I started calling CQ. 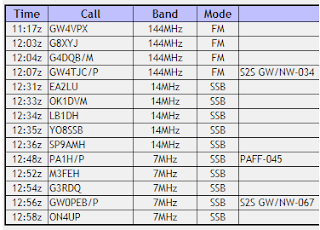 This was a very slow process and I thought there was a problem with the Yagi so had a little play with the connections and then made a few more contacts. Once the summit was qualified on 2M I went to 20M made 5 fairly quick QSO's and then tried my luck on 40M and made a further 5 contacts. I had managed 2 S2S's and PA1H/P doing Flora Fauna, the S2S activation's were GW4TJC/P (Simon) GW/NW-034 and GW0PEB/P (Rob) GW/NW-067. This was a good day out and we both enjoyed it. This will be on my re-visit list for next year and maybe a winter summit to add a few more points. 15th July 2017. GW/SW-041 SOTA Activation visit. 30th June 2017. GW/NW-001 SOTA Activation visit.